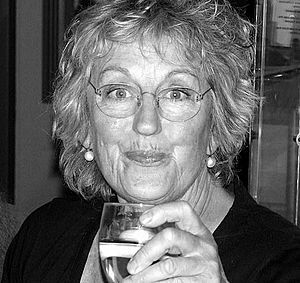 Germaine Greer (born 29 January 1939) is an Australian writer, journalist and scholar of English literature. Many people think she is one of the most important feminists of the late 20th century. Greer was born in 1939 in Melbourne, Victoria, Australia. She went to a convent school, and later went to the University of Melbourne. She got a degree in English and French language and literature. She moved to Sydney, and became a lecturer at the University of Sydney. She got a Master's degree there, and then moved to Cambridge, England. She gained a doctorate degree (PhD) at Newnham College, Cambridge. Greer's approach is different to that of some other feminists; she has defined her goal as 'women's liberation' instead of 'equality with men'. This is because she does not think women should want to be like men who also have problems in society. Germaine Greer Facts for Kids. Kiddle Encyclopedia.